Most of us like to believe that we make decisions more rationally than emotionally. I certainly like to think so about myself. I have to tell you that this book has slightly rocked my thinking. I am becoming more convinced by this look at the psychology of decision making that far more of my choices are gut reactions that I later try to rationalize. Daniel Kahneman makes a very convincing argument that people are incredibly quick to jump to conclusions, make decisions without enough information, and have their decisions greatly influenced by the first information that they are given. We will even be influenced in our decision making by information that has nothing to do with the decision we must make. One example that I loved was a study done in which people were asked, “was Gandhi older or younger that 144 years when he died?” Obviously the answer is less than 144. Those same people were then asked how old they thought he was when he died and far and away people picked numbers in the 80’s and 90’s. A second group was asked, “was Gandhi older or younger than 44 when he died?” Most said older. When asked how old they thought he was when he died a vast majority of the answers were that he was in his 50’s. What is shows is that people were highly influenced in their decision by a number that was in their head yet had nothing to do reality and should have had no impact on their choice. This has practical application in everyday life because marketers know that we make decisions these ways and they will use everything in their power to subtlety manipulate us into a decision that favors them. There are also huge implications in what Kahneman say when it comes to race relations and other interactions with people who are different from us. We will use limited information to make decisions about someone. Can we trust them? Are they friendly? Are they competent? Not only do we make these decision on race relations but on who we vote for and want to work with. All of this has caused me to try to slow down my gut reaction and think through my biases and preconceived notions. This is a book that will cause you to rethink how you make decisions. Your gut reaction at times will be to say that you are not a person who jumps to conclusions or reacts emotionally first. Slow down your process a bit and read the book. What I am sure you will find is that you are more like that than you ever thought. 🙂 Happy to add you as a friend — will visit your blog to keep updated! Awesome site Dan. GOD IS AWESOME and it is wonderful that you listened and learned. May God continue to richly bless you, Barb and the Guys. I work for a pr firm that is helping Discovery Church in Orlando promote the World Vision Experience: AIDS-Step into Africa exhibit that will be at the church from May 15th-22nd. Do you think you could include information about this on your blog and website? Please go to worldvisionexperience.org for more details. I came acrosss your blog in research for an article I am writing. I love your view and hold similar ones to you. One of the largest platforms we teach on are the amount of non-productive Christians that exist in the world today. Casual Christianity has taken over the body, sad as it is to say. We teach people all over about what it means to really follow Christ. It’s amazing how many carry scripture in their hand but have never read it, or at least really read it. Excellent website! I have really been enjoying reading your posts. Sorry I was so long in getting connected. Thanks! For this, and for EVERYTHING. It is amazing that I found your website. I work with ladies who all claim to be holy christians but I don’t always see the fruit of God. One lady who says that she speaks in tongues started talking about the end of the world predictions in 2012. I have no idea why but I blurted out “You’re already dead and in 2012 you will come to life.” Was God using me? I felt so good after saying it. What do you think? Just read and very much enjoyed your review on Harry Potter and LOTR. So encouraged to see someone put into words what I was thinking! Keep it up! Thanks for the encouragement. Please pass on the link to your friends. I apologize for the multiple emails however given our recent growth I feel I should re-open our previous discussions. If you don’t recall this is Jaime Laviena, one of the editors with Christian.com. My last email to you was in regards to our interest in collaborating with your site and potentially driving more traffic to each other. I fear you may have declined our initial request due to our lack of size of numbers. At this point in our growth we have reached well over 31k unique users and are growing at a much faster pace then initially expected. I would like to resend an invitation of collaboration to you with hopes you find our growth shows promise. Thank you and I look forward to your thoughts. Hi, I have a question???? or two? Do you consider yourself a genuine christian? How do distinguish yourself as a genuine christian and followers of Jesus, and the various hate groups who claim a christian identity. This is a terrible epidemic problem within the christian community. I have had some education in reading and studying my bible, and you sound as though you are a genuine christian. This is a legitimate question and not intended to be a challenge. I have great concern for protecting myself from hate groups who claim they follow Jesus. I know from Biblical teaching that Jesus is not a God of hate and what I studied did not teach me to hate. In other words, I do not want to be a part of any organization that has hate as a method of teaching and preaching about the Love God has for humankind. I certainly understand your struggle of seeing so many Christians who seem angry and hateful. I think that in many cases such responses come from people who are actually insecure in their faith and relationship with God. The anger that comes out is a result of feeling their grasp on their faith being peeled away or threatened. As a result, when they are confronted by a person or idea that runs counter to what they believe, they react harshly. It is sort of like the person who is losing the argument so they yell the same thing only louder. The Bible is abundantly clear that we are to love our neighbor, even when they are difficult and hate us. That is not an easy thing to do, but we are called to it none the less. As far as my own faith is concerned, yes I think I am a genuine Christian as you say. Part of being able to say that also means recognizing that I am a person who still wrestles with my own areas of sin and weakness. It is only by the grace of God that I can have a relationship with Him and call myself a follower of Christ. Acting upon gut reactions is always risky. I’m a retired Army officer. An old Army adage states, “the first report is always wrong.” While the Army encourages its leaders to be decisive, there is also the realization that, when possible, it’s best to let a situation develop a bit before making a decision. Let’s say that cognitive scientists are correct, that most information is received and then decided upon through an emotive process… what follows? Again for the sake of argument, if emotional action is the first action, how does that give it the authority to make decisions little lone rational decision? Kehneman would do well to read some of the works of different Christian Philosophers with regard to this area. Although I have taught statistics, I was initially confused by the insertion of a red herring, a bank teller, into the Linda problem. The 85% of students who gave the wrong answer were undoubtedly fooled into an intuitive Bayesian analysis by the obvious inference, feminism<anti-war +philosophy, as I was. Similarly the second problem can be easily misunderstood to be "what is the most probable cause of a stock market crash next year. It is not very difficult to formulate questions that fool students into giving wrong answers. These are not normally rewarded with Nobel Prizes, so it is a little hard for me to understand the importance of these examples. Hands down, one of the best books in its genre. 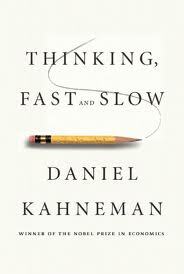 Thinking, Fast and Slow by Daniel Kahneman is a lengthy, self-conscious and a challenging read but highly recommended if you’re interested in why human beings behave the way they behave. It’s given me so much ‘oh snap, so that’s why we’re so dumb’ moments that at this point I don’t even want to admit I’m a human to any space-time traveling race that comes in collision of 21st century Earth.